How do you “make” a promise? The engagement ring is the most common earner for jewellers today. According to tradition, the proposer offers the ring as a promise to marry the recipient. While it’s a beautiful concept, it has been corrupted in modern times by companies that commodify this object. They would have you judge the depth of love by the size (and expense) of the diamond. But if we go back into the histories of jewellery, we find many alternative ways in which people use objects to make vows. And there are many other kinds of promises: to care for a child, to be loyal to your tribe, to be kind to others, to preserve nature and, finally, to yourself—to be healthier or more determined. Ten jewellers from different countries have re-imagined the promise object. Voveo (means “I promise” in Latin) presents work by Raquel Bessudo (Mexico), Louiseann & Kristian King (Australia), Vicki Mason (Australia), Clare Poppi (Australia), Gina Ropiha (Australia), Mia Straka (New Zealand), This Means That (Thailand), Bic Tieu (Australia) Alice Whish (Australia) and Keri-Mei Zagrobelna (New Zealand). To connect these objects to everyday life, they are distributed throughout Melbourne City Library. Many of the artists will be in attendance to deliver promises. 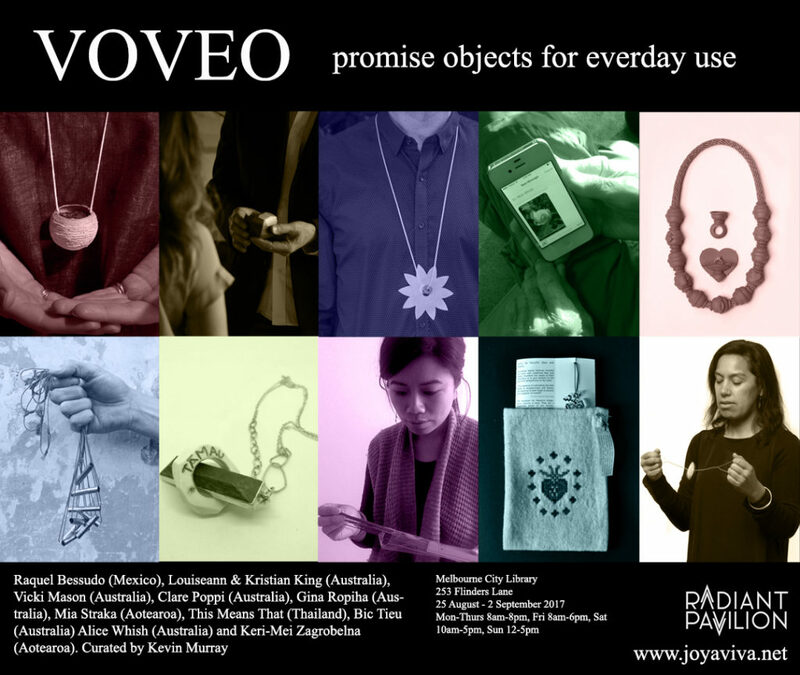 You can see Voveo at Melbourne City Library, 253 Flinders Lane, 25 August – 2 September 2017. Hours are Mon-Thurs 8am-8pm, Fri 8am-6pm, Sat 10am-5pm, Sun 12-5pm. In association with the Centre for Art, Society and Transformation RMIT. You can read the argument for this exhibition and explore the inspiration board for the artists.